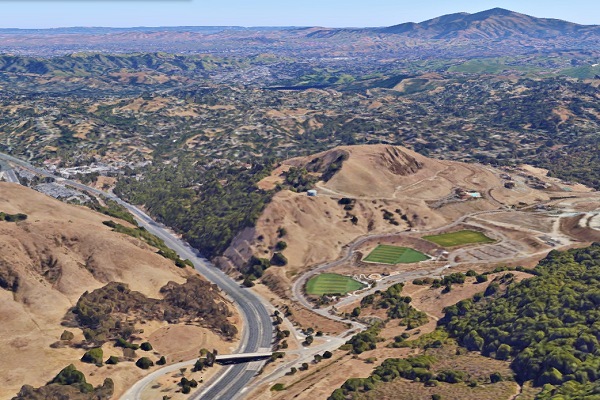 As far as I know this hill has no name, but it’s a highly visible part of Orinda. You pass it on Route 24 between the Wilder exit and downtown, as seen in this Google Maps perspective view. The USGS topo maps give it an elevation of 1204 feet, so I’ll call it 1204 Hill. It’s part of San Pablo Ridge, but the west branch of San Pablo Creek cut a deep gorge through the ridge while it was being uplifted, forming a classic water gap. 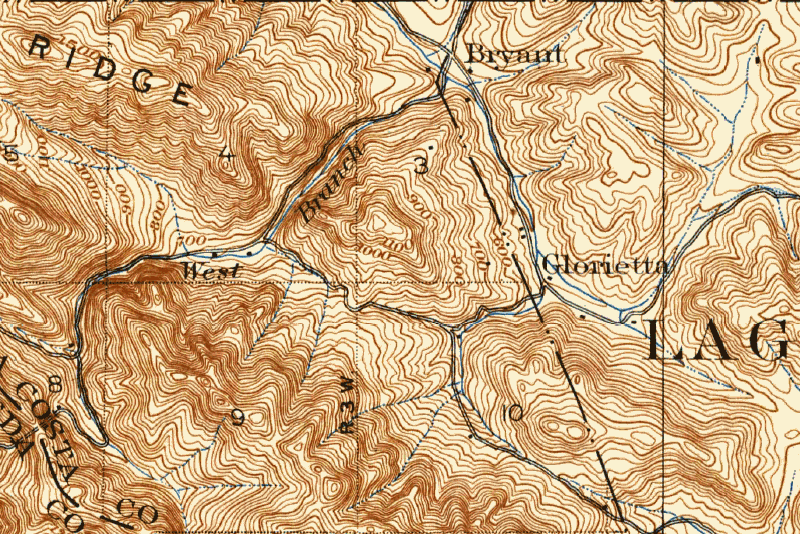 That’s clear to see in the 1915 topo map, made before anything significant was developed there. During the mid-20th century, at least four quarry pits ate their way into this hill, one on the north side and the others on the south. 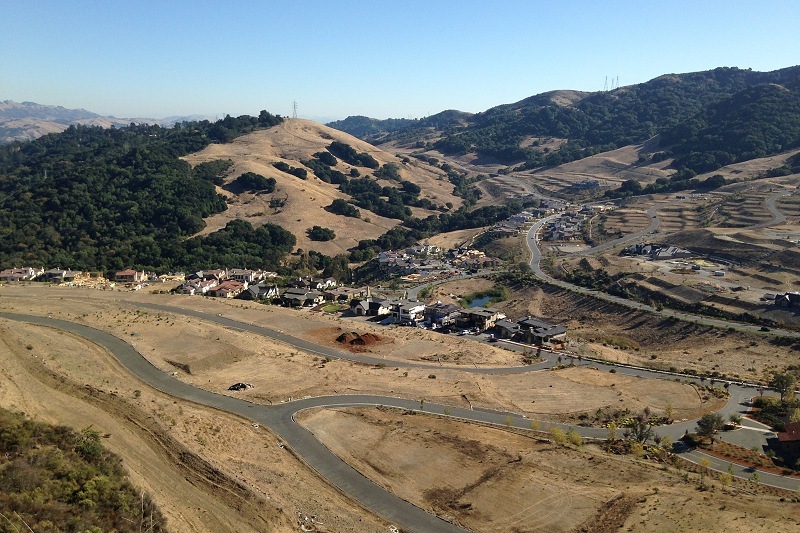 Now it provides a bit of seclusion to the exclusive luxury Orinda Wilder development. 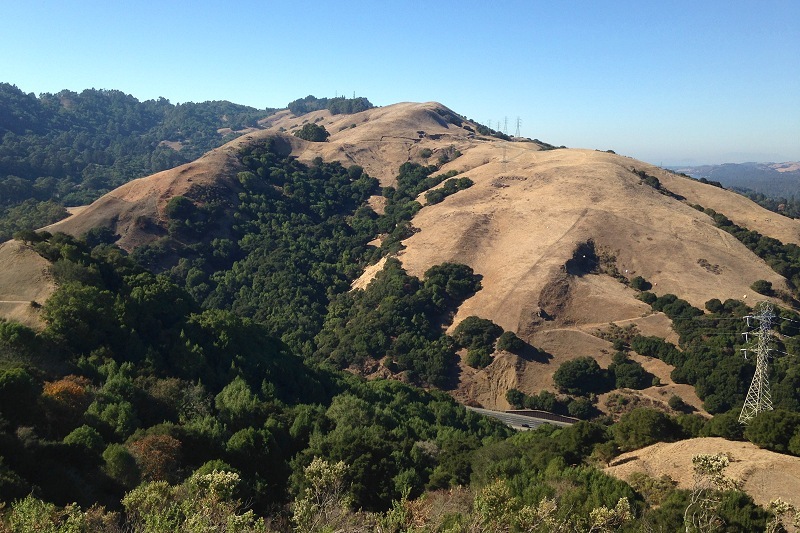 I paid the hill two visits this month, and to me it offers seclusion from Orinda Wilder. Here it is, as seen across Wilder Valley last summer. 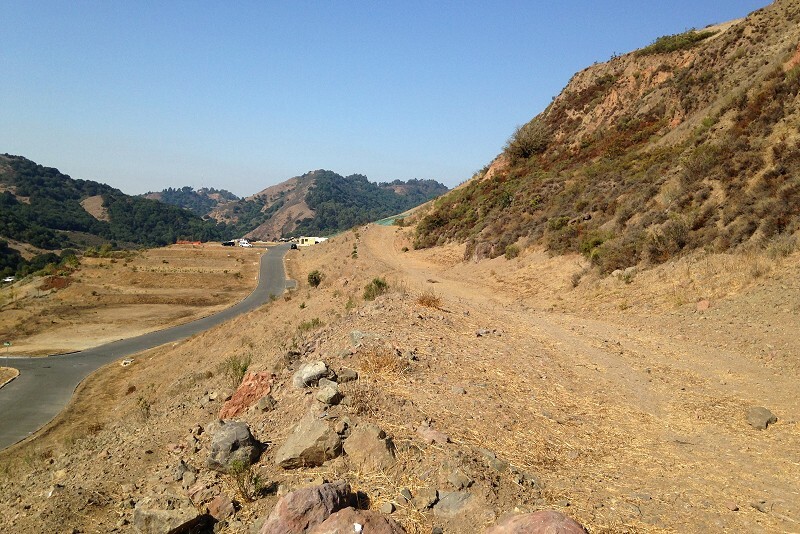 A fire road encircles the hill for your visiting convenience. It offers good views all around. This is looking north across 24 to grassy Eureka Peak along with wooded Vollmer Peak behind it. Both are also part of San Pablo Ridge. And in the other direction is the last, southernmost lump of San Pablo Ridge, separated from 1204 Hill by another branch of San Pablo Creek. Looking west, Route 24 approaches the wall of the Oakland Hills. Eureka Peak, at the right edge, and 1684 Hill on the left, part of Gudde Ridge, form the sides of Siesta Valley. 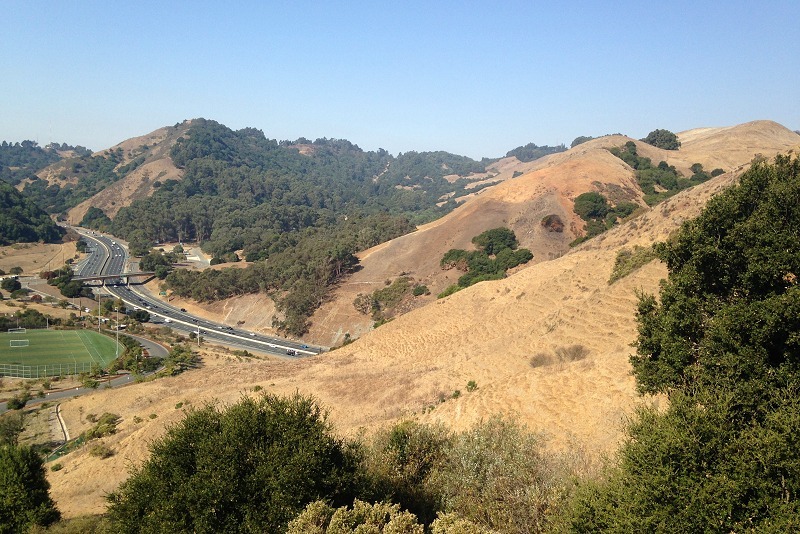 Both peaks are made of the same lava of the Moraga Formation. The formation is folded like a taco shell under Siesta Valley, a geological feature called a syncline, and hey why don’t we look at the geologic map now. This is the same area shown in the topo map. 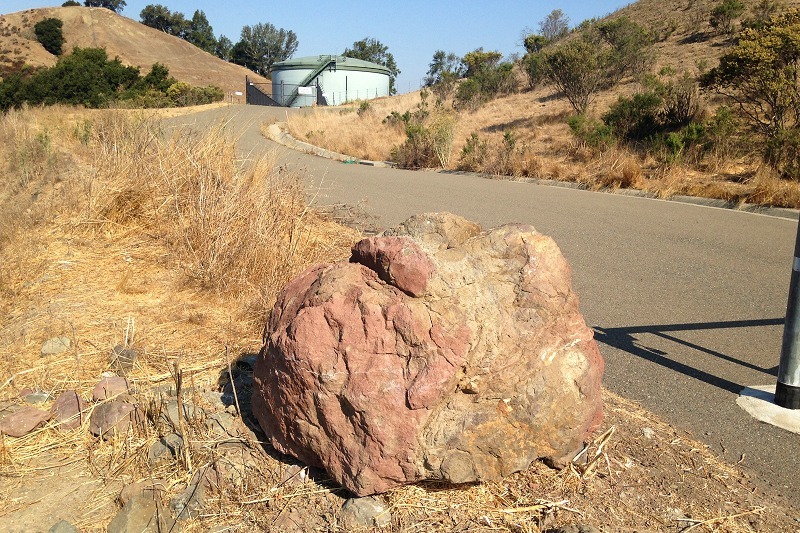 “Tmb” is the basalt lava of the Moraga Formation — the taco shell — and “Tst,” the Siesta Formation, is the filling. That red line with the little arrows is the axis of the syncline. The light-yellow unit “Tms” is sedimentary rocks, also in the Moraga Formation, that were laid down between eruptions of lava. 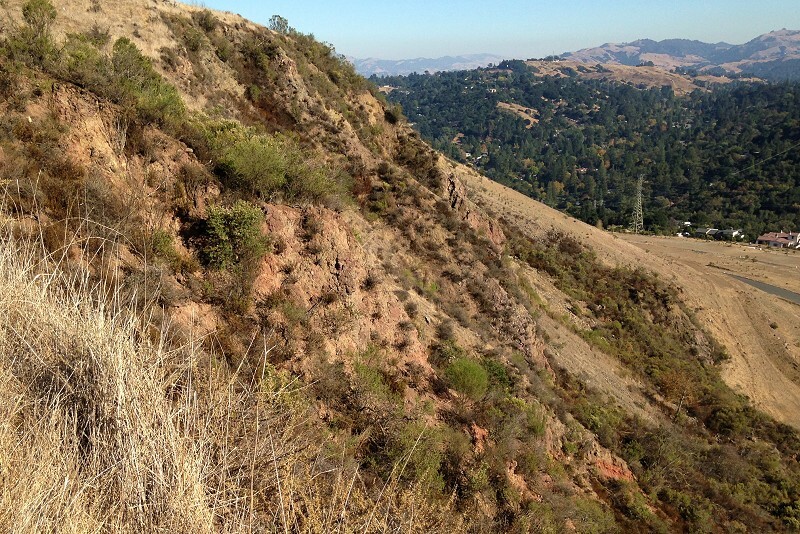 To the right of the black toothed line — the Moraga fault — the rocks are much younger and I won’t mention them again. 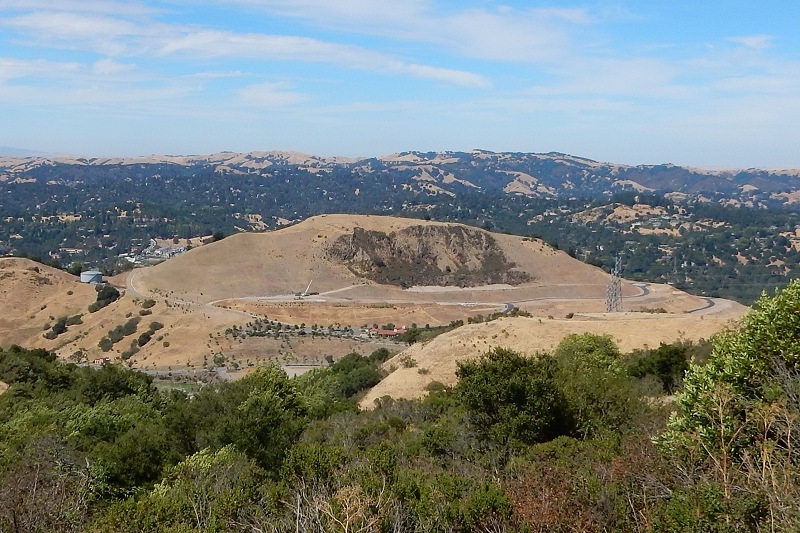 The quarries were excavating freshwater limestone from the Siesta Formation, used to produce cement and soil amendments, and basalt from the Moraga Formation, used for crushed rock. Here’s the lava. Where lava flowed onto wet ground, the underlying clay got baked and the steam oxidized the lava, turning both materials red. It’s not always easy to tell what’s what. There are bits of light-gray limestone here and there. You can tell by the way a drop of acid fizzes vigorously on it. I didn’t take a picture, but I did stop to shoot examples of mineralization in the lava. They might be copper compounds, or phosphates, or several other possibilities that aren’t easy to identify just by eyeballing. 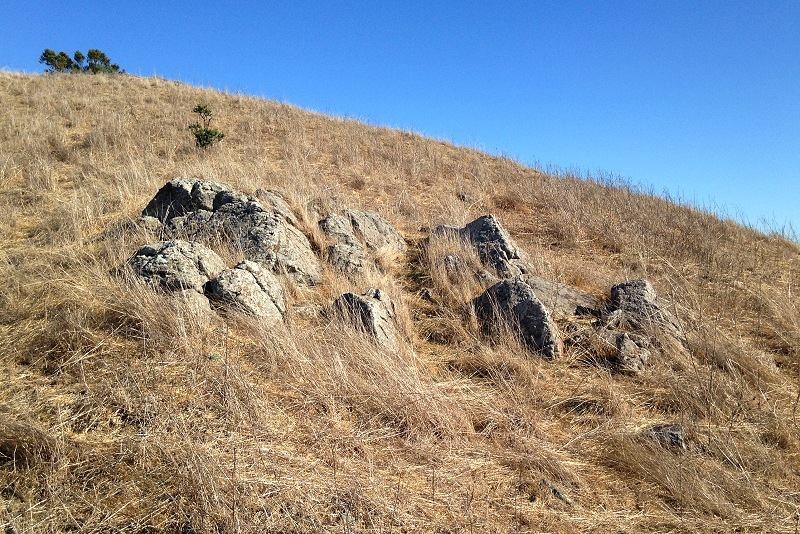 There’s also a little conglomerate that looks for all the world like the Orinda Formation. 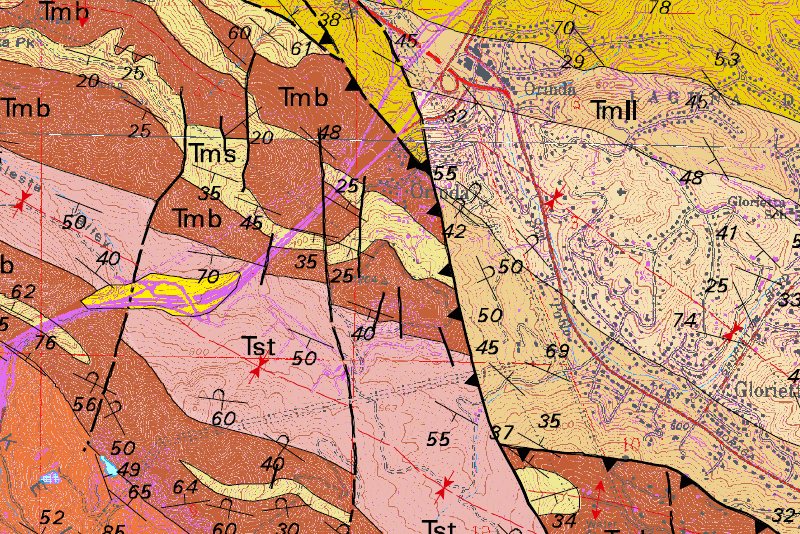 It goes to show that a geologic map is a simplification of a wacky, complicated Earth. However, I don’t quite trust the stone because it’s loose, not a proper outcrop. Climbing the hill from the fire road is a scramble. There are only subtle trails, the kind that deer make. But on top of the hill there’s the stubs of a former water tower, and a stone spiral with a little cairn at the center, the kind that locals make. And outcrops. The last thing to mention is the quarry scar. It displays the structure of the Moraga Formation nicely. But the exposures are unapproachable and dangerous. I’m not sure what the developers plan to do with this hill. Probably nothing except watch it closely. The closest street to the quarry scar has home sites only on the far side of the road, and there’s a wide ditch between the road and the quarry that will catch falling rocks. I’m gonna keep my eye on this interesting spot. 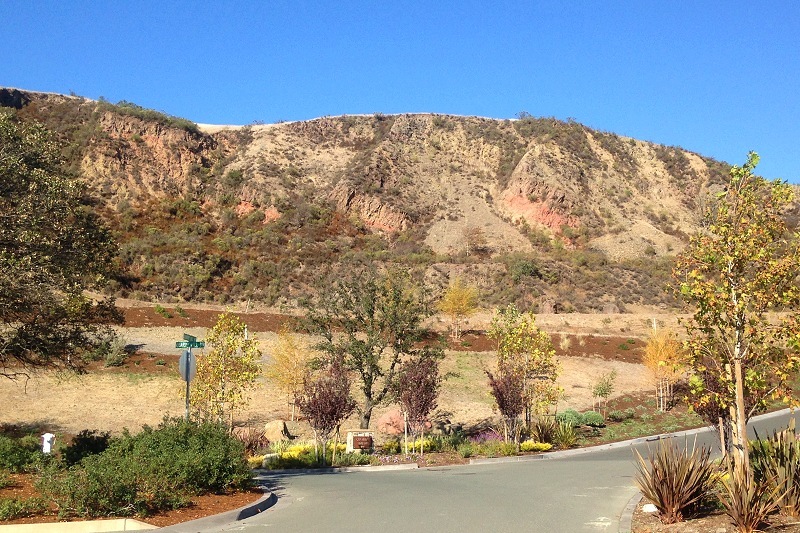 This entry was posted on 30 October 2017 at 8:02 am and is filed under Oakland geology views, Old quarries. You can follow any responses to this entry through the RSS 2.0 feed. You can skip to the end and leave a response. Pinging is currently not allowed. John C. spent a lot of time on the hill. The most interesting rock he found was a light green chert, green probably from nickel, in a basalt matrix. He also gleaned information that the hill was part of the areas dedicated to remain open space as part of the development agreement. Thank you for the further information about this area. That would be the second of the two green rocks, which I took to be chert. I see no basis for specifying the green element as nickel. 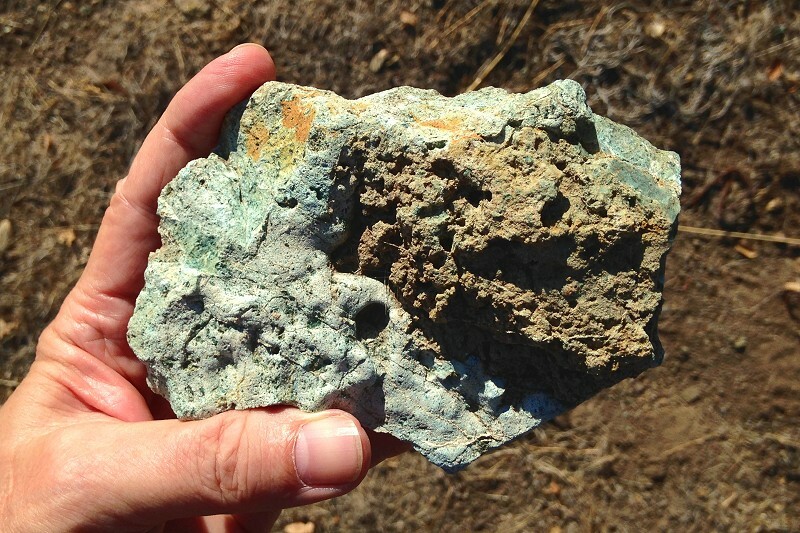 The green mineral is most likely celadonite that lines cavities in the Moraga Basalt and often forms a layer on the underside of chalcedony layers and sometimes colors the chert green. 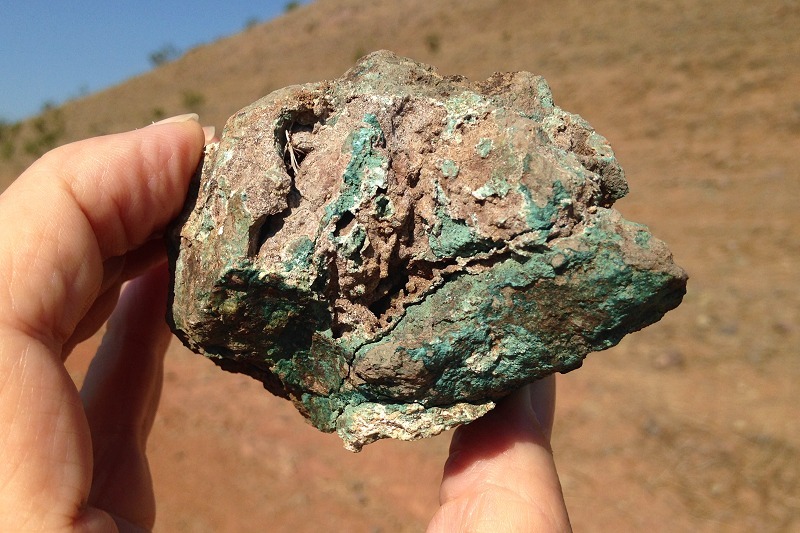 I call some of the chert found nearby in Orinda: Orinda Teal Opal. Volcanic breccia on the hill is veined with quartz, celadonite, rare fluorescent golden calcite, and possible other minerals indicating vigorous hydrothermal activity. Geologists for the nearby housing developement mapped fault and breccia zones that extent from the nearby lacustrine deposits into the volcanics of the quarry. The faults may be related to the hydrothermal activity. If you go visit the quarry make sure that you park in the spaces designated for visitors because this area is private. Don’t park off the road in the gravel; security does not like it. 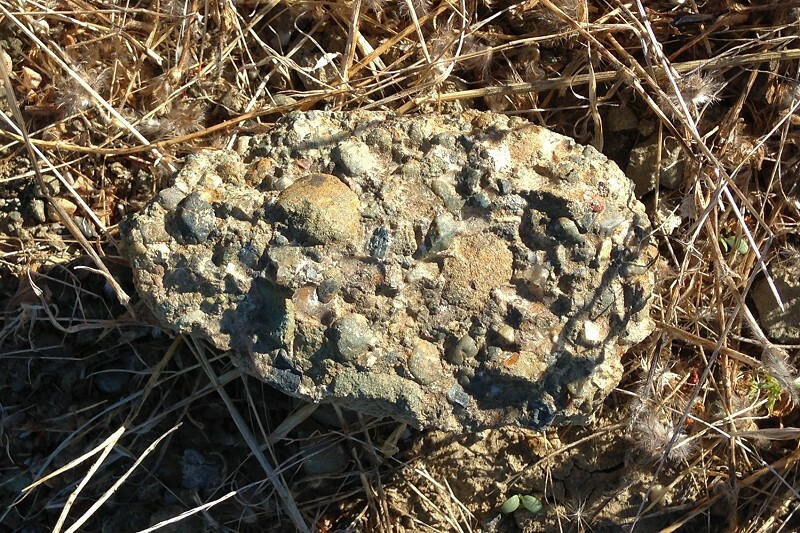 Wherever you find Moraga Basalt in the East Bay you will find chalcedony and quartz nodules, some with nice crystals. The famous Berkeley Blue Agates come from the Moraga Basalt. 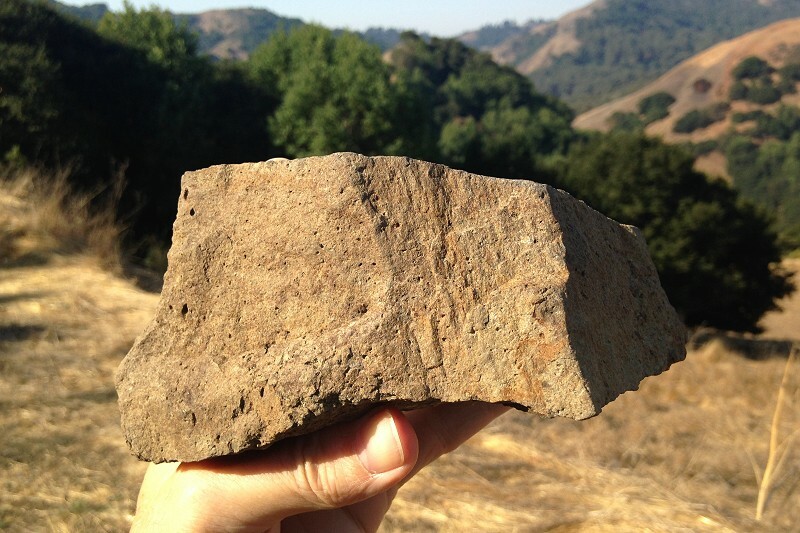 Greetings from John C. to mpetrof and Andrew both dedicated aficionados of the fine East Bay Geology.